We are delighted to announce the launch of our new online catalogue and shop. The new shop is easier to navigate and where applicable, will automatically calculate quantity discounts. The shop also complies with the highest standards for online security. It is validated to have a secure SSL certificate which provides industry standard data encryption of information transferred from your computer to the website. We hope you enjoy using the new format and would welcome any feedback from you. The annual Designer Bookbinder Competition was judged at the end of October and the award ceremony was held on the 5th December at the John Rylands University Library in Manchester. We are very pleased to announce that the 2009 J. Hewit & Son prize for 'The Interesting Treatment of Leather' was awarded to Jeanette Koch for her binding of 'Urban Birds'. Our warmest congratulations go to Jeanette for this very well deserved prize. Over two years ago I bought a black ostrich skin which sat in my drawer in the bindery waiting for the right book. Last year I wanted the chance to have fun with a speculative binding. I laid my hands on Urban Birds, grabbed the ostrich skin and saw how lovely its natural edge was. Loath to cut it, I decided to top and tail the binding using the edge to effect over a natural goatskin, leaving the horny textured area to lie loosely over the spine. Jo Spaul's cuts are stark and often framed with a strong dark blue or black line, which the ostrich skin's intense black complements well. I had planned to leave the middle section of multi-coloured leather underlays as a continuous area on each boards, but a moment of interruption when I was just about to cut out my headcap leather pieces caused my concentration to fail, and I cut into the wrong bit of my precious and very small natural goatskin remnant! I then revised my design and split up the multi-coloured underlay areas, which in the end worked much better. The title is tooled in blind on the front board alongside tooled bird's feet traces on both boards. 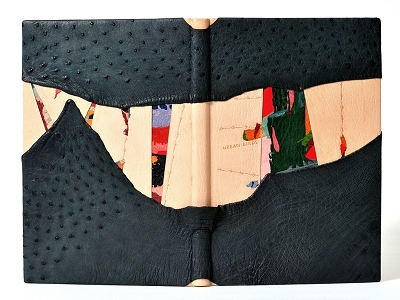 The top edge is coloured with gouache, and the endbands are made of multi-coloured leather onlay bits. Brown paper doublures are followed by flyleaves decorated with coloured Japanese Mingei paper strips sandwiched in between speckled-egg textured paper. Anyone looking at this binding will query the term 'Urban Birds', as ostrich, unless farmed locally, is dubious and my underlays smack of the tropics rather than London despite the parakeets in the park. But with global warming who knows! Exciting News for us 2010. This Summer, we will be moving from our current premises in Currie to a new location a few miles outside of Edinburgh. Further information will become available later in the year.